Another building proving the remarkable influence of the Venetians on this island it is the castle located in Bochali at the back of the city of Zakynthos. Almost nothing remains of the ancient building, only the walls but it is worth visiting the ruins that are in the greenness of a grove and from where it is possible to admire from the top the entire chief town of the island. In the past where now there are the ruins of the castle there was the medieval town of Zakynthos which consisted in many houses and twelve churches of which after the many earthquakes and wars nothing remains. 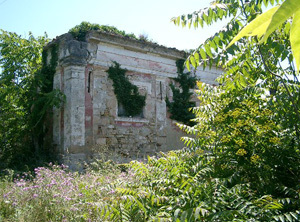 In 1970 the walls were consolidated since, after the numerous earthquake, they risked to fall down and in 1984 thanks to the diggings many churches dated back to the 11th and 18th Century and other ruins that go back to the Byzantine period and the English occupation came back to light. A cement cross of such dimensions to be spotted even at kilometres of distance from the town where it is located, Kabì or Kampi. 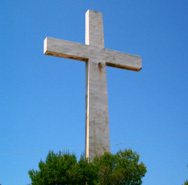 The cross strikes for its dimensions but it represents and remembers those who passed away in the civil war. It is impossible to forget them with a symbol that is visible from the sea even though located on a promontory more than three hundred and fifty metres from the sea level. In order to see the small Venetian Tower you have to reach the town of Exo Chora, North of the island, and then go from the town centre to a road on the left to drive for some kilometres. Up to a certain point the road isn’t asphalted anymore and you have to carry on to the promontory where the scout tower is. The tower is of small dimensions and it is more or less very well preserved. In the past it was used to spot the enemy coming from the sea. The position is perfect since from here it is possible to view the larger part of the western coast of the island. After the tower the road carries on but we suggest not to drive down it since in very bad conditions and without exit. In Argasi, a town close to Zakynthos, it is possible to see a bridge dated 1800 that it half lays on the sand and half in the sea. 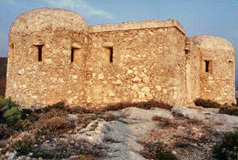 It is uncommon to admire such a ruin of the past a few kilometres from huge hotels areas even this is unique in Greece. 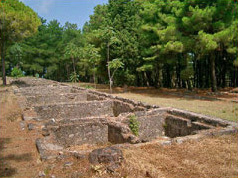 Close to the town of Mouzaki, it is possible to visit the ruins of an English Villa that resisted the earthquake in 1953. 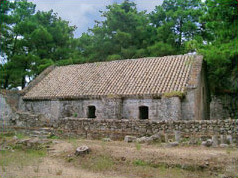 The Villa, named Sarakina, belonged to the Lunzi’s family and it is a typical example of refined house, built in neo-classic style, typical of Zakynthos houses before the catastrophe. Only the façade of two floors with the main entrance and seven windows at the first floor remained intact. 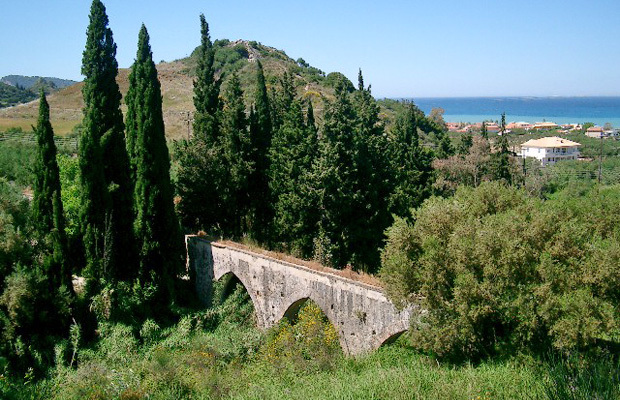 The area around the town of Argasi presents some remains of ancient buildings such as the bridge on the beach, the ruins of a church and the remains of an aqueduct used in the past to supply water the entire area. The aqueduct is reachable by a non asphalted road hidden in the vegetation that goes from Argasi to the countryside and there are no signs informing where it is located.